Even on dark days there is a carefree atmosphere walking down to the Albert Dock. Tourists flock, flags flutter, the sky opens out, and the city turns into a seaside promenade. It is an appropriate location for the most substantial showing of John Piper’s work since the 1983 retrospective at Tate Gallery in London. But to be swept up by the whistle and dally of Piper’s art would be to miss an important message. The show takes a detailed view of the artist’s output from the earliest, almost naïve oils, through his purely abstract compositions of the thirties, before a brief glance at his war work and a coda centred on his stained-glass commissions for Coventry and Liverpool Metropolitan Cathedrals. ‘What did it mean to make art in Britain in the context of European modernism?’ is the exhibition’s central issue, according to curator Darren Pih. Appropriately, plenty of emphasis is placed on Piper at his most abstract between 1934 and 1938. In the first room a black Alexander Calder mobile hangs like a magnificent, atomised spectre over one of Piper’s austere constructions of metal and dowel. The Calder is static, always tempted to movement, and Piper’s work suggests similar lines of navigation and communication. Nearby, a small abstract by the French artist Jean Hélion, owned by Piper, sits next to one of his own paintings from the following year. These highlights contextualize Piper’s work from the thirties, displaying his individual brilliance amongst commanding company. On the central wall of the main gallery a thrilling trio of his big-hitting abstract compositions, all blues and greys accented with red and grounded by ochre, give a watertight seal to this impression. 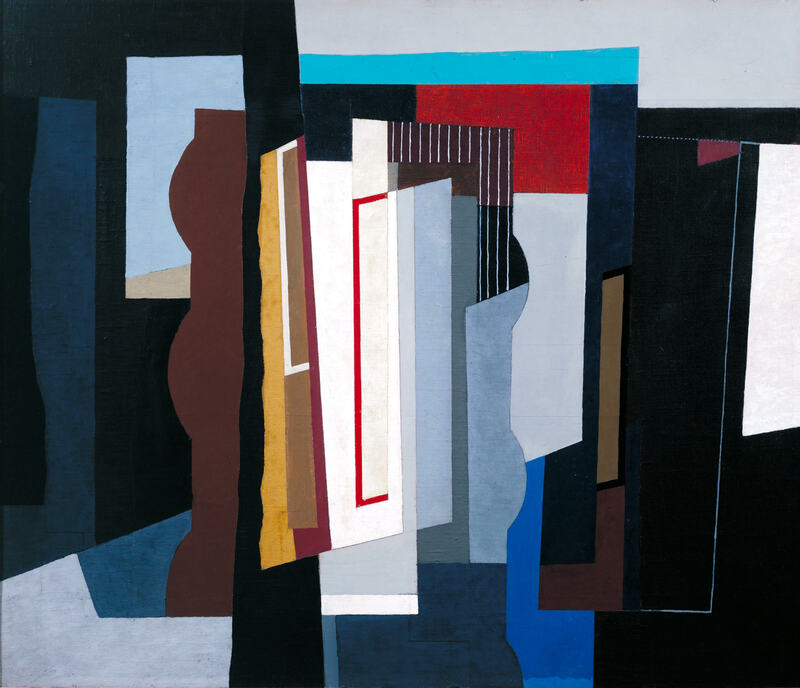 Not a purist showing of Piper’s work, Tate instead pays homage to his early awareness of European modernism and his struggle to formulate a distinctively British interpretation of modern art that might resonate internationally. Piper’s project was shared with the writer, his wife, Myfanwy Evans, but its success is questionable. Pih rightly comments that Piper remains little-known beyond the UK – but this more likely due to the way art histories have or have not been written in the twenty-five years since his death, rather than any issue in the work displayed here. He was, weirdly, excluded from Tate’s 2012 exhibition Picasso and Modern British Art which did so much to nuance understanding of how the likes of Ben Nicholson and Wyndam Lewis traded influence with the continent. Placing Piper’s collages next to Picasso’s, without the art historical support other contemporaries have been provided, risks painting him as either a derivative irrelevance or a crude provincial. Thankfully, despite what the Guardian’s Jonathan Jones suggests, neither proves to be the case. We sail safely between vernacular and international styles. Piper’s work stresses Britain’s role within any narrative of European art. This is most blatant in Harbour Scene, Newhaven (1936-37), where a Union Jack flies next to a Tricolour. It was made while civil war gripped Spain and Ernest Hemmingway remembered John Donne’s wisdom that ‘No man is an island entire of itself’. (A similar, earlier work features the cliffs of Dover figured from newspaper clippings of an article on rising unemployment and Britian’s growing Labour movement.) Here are coastal subjects as vantage points from which one can throw a rope around the continent and your fellow man. For Piper, the nautical character of his island nation always held an irony and a paradox: the sea can be imagined as a conduit as well as a natural barrier. And either way our isolation is constantly undermined whether by train lines drilled under the seabed today or—as he argued in a 1938 essay for the Architectural Review—the suitability of Le Corbuiser’s ‘Nautical Style’ to a British context. Tate’s exhibition could do more to demonstrate the continuities between the different phases in Piper’s career, his independence and his downright strangeness. It all seems smoothed out, imposing a classical calm on the most romantic of moderns. Piper the abstract avant-gardist is shown here in spades. His work from this phase is an art-language audiences and today’s press know well. Subtle but obstinate and subversive peculiarities that bleed through Piper’s later work are altogether more difficult to address. Conventional understandings of modernism (see J. Jones) still recoil from them and box offices sales would react likewise. The messy, moss-ridden, Piper of the late thirties and forties, who promotes ‘pleasing decay’ and claims kinship with Turner and Cotman, remains largely hidden at Tate. We will only see this less familiar version of Piper blazoned on billboards when we can feel unapologetically inspired by artists who could repurpose a nostalgic love of landscape and history to support a radical political and aesthetic outlook. 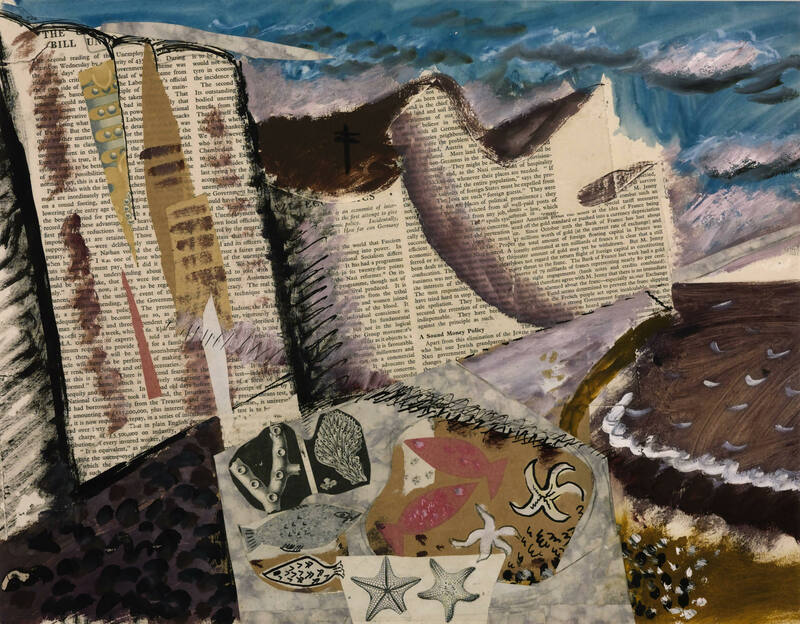 John Piper will be on display at Tate Liverpool until 18 March 2018.